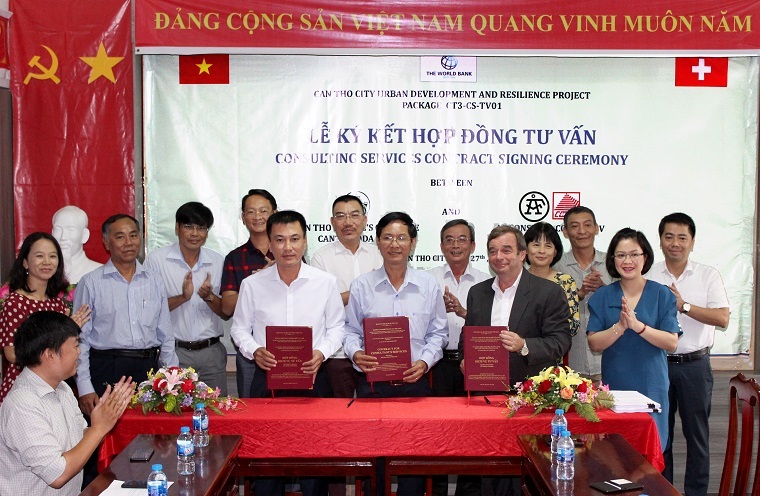 On July 27, 2018, in Can Tho city, the Consortium of AF-Consult Switzerland Ltd. (Switzerland) and CONINCO have signed the contract package of CT3-CS-TV01 on construction supervision and contract management for the construction package of Component 1. In the morning of May 22, 2018, CONINCO held a meeting to appoint the leaders of the Construction Inspection Center. In the morning of April 24, 2018, the Ministry of Construction awarded the Prize for high quality construction work of phase 3/2017 and phase 2/2018 including the Project of Expansion of T2 International Terminal - Tan Son Nhat International Airport in which Consultant and Inspection Joint Stock Company of Construction Technology and Equipment (CONINCO.,JSC) was the construction and equipment installation supervisor. On March 17, the Grand Opening Ceremony of the 5,000-seat multi-purpose Stadium of Dong Bac Sports Center (Dai Yen Ward, Ha Long City) was organized in Ha Long City. This is a key project for the effective implementation of important sports institutions of Quang Ninh province with the scale of nearly 15ha, the total investment of more than 1,100 billion dong in the BT form invested by Vingroup. CONINCO well completed the project management consultancy, construction and equipment installation supervision for this project. Responding to movements and activities of Youth month, on March 16, 2018, the Youth Union of CONINCO participated in the program of Gratituding General Vo Nguyen Giap and Talk about Ho Chi Minh's moral example organized by Youth Union of Ministry of Construction at the Memorial House of General Vo Nguyen Giap (No. 30 Hoang Dieu, Hanoi). To motivate the spirit of female staffs in the company and with the consent of the General Director, Trade Union Executive Committee, the Women’s Committee of CONINCO organized the trip for the whole female staff in the Company to worship Buddha and visit the Cao Lanh Pagoda, to visit Bach Dang Giang (Thuy Nguyen district, Hai Phong city) and Ba Vang Pagoda (Uong Bi city, Quang Ninh province) on the occasion of International Women's Day on March 8, 2018.